We understand how embarrassing losing a tooth can be. We also understand that not replacing the lost tooth can mean serious complications arising, including an older appearance. Fortunately, we can help you enjoy a full smile again with a unique and lifelike dental prosthetic: dental implants. Do you have questions about dental implants? Question: What dangers does tooth loss pose? Answer: When you lose a tooth, your body responds by suspending the flow of calcium and phosphorus to the jawbone around the missing tooth. Without these nutrients, the jawbone can begin to deteriorate, which can lead to further tooth loss and an aged appearance, including sunken cheeks and a ptotic chin in extreme cases. In addition, the surrounding teeth can drift as a result of gap in your smile, leading to misalignment. Finally, you can have trouble eating and peaking clearly if you lose multiple teeth. 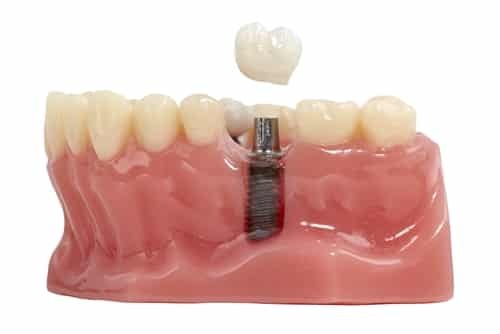 Question: How do you place dental implants? Answer: Dr. Kania will insert the implant post into the jaw. The post is made from titanium, a biocompatible material that actually bonds with the jawbone, acting as a new tooth root. After the area heals, we can place a restoration to complete the tooth. Question: What does a restoration consist of? Answer: The crown, bridge or denture we use as a restoration will look as natural as possible and provide a quality restoration. Question: Will gum disease prevent me from receiving them? Answer: We will need to monitor and treat the issue before placing the implant. While gum disease can’t be cured, we can manage it to prevent the onset of periodontitis, which can lead to implant failure. We have a number of treatment options to protect your smile from tooth loss and other complications of untreated gum disease. If you have any questions about dental implants then please contact our office today. Ready to Try Dental Implants? We can help offer a lifelike solutions to tooth loss with implant dentistry. For more information, talk to your Encinitas and San Diego, CA periodontist. To schedule an appointment with Dr. Kania, contact her office today at (760) 642-0711.